The Toronto International Film Festival (TIFF) is one the city’s most highly anticipated events. During the first 4 days of the 10-day festival, a section of King Street West (between Peter St. and University Avenue) was cordoned off to create Festival Street. The avenue became alive with the sounds, colour and action generated by one of the largest and most important film festivals in the world. Founded in 1976, it has grown exponentially, each year adding more features and events to enchant movie-goers and the general public. This year, held September 6th to the 16th, the festival is the most exciting I have ever experienced. This year’s Festival Street became a food fair as outdoor cafes were more numerous and more expansive. As well, there were many food trucks serving ethnic and gourmet menus. People seemed to be enjoying the culinary treats as much as wandering King Street, many of them hoping to spot a movie star. It was a constant delight, as many companies offered complimentary samples of their products. Another change was that the north/south streets of Peter and John were more utilized than in previous years. For those who were unable to visit the Festival Street on King Street West, or for those who wish to relive a few memories of their visit, this post features photos taken on the night of Friday, September 7th and during the daylight hours of Saturday September 8th. The Bell Lightbox at the corner of John and King Streets. Throngs crowd the entranceway where the stars enter to walk the red carpet. Sidewalk cafes on the south side of King Street, opposite the Bell Lightbox. Looking south on John Street from King Street West. A stage is visible in the distance, near Wellington Street. The Air France Bistro on King near Simcoe Street, where many people enjoyed being photographed beside the miniature Eiffel Tower. Crowds in front of the Princess of Wales Theatre awaiting the appearance of the stars. The Royal Alexandra Theatre where the popular musical “Come From Away” is playing. The chairs and the trees in the foreground are part of the King Street Project. The Roy Thomson Hall at King and Simcoe where films are featured during TIFF. Entrance to the Roy Thomson Hall on Simcoe Street. King Street between Simcoe and University Avenue where many food trucks were located. Food trucks on King Street, west of University, the truck in the foreground operated by Arepa, featuring Venezuelan food. Arepa’s restaurant is at 490 Queen Street West. A TIFF volunteer continuously assisted people to have their photos taken in front of the TIFF sign, located at the west-end of the section of King Street that formed the Festival Village. Outdoor cafes on King Street, west of John Street. The cafes that are part of the King Street Project were extended further into the street. Cafes on the south side of King Street, opposite the Bell Lightbox, located on the north side. Cafes opposite the Bell Lightbox. A display created by La Fenici Italian Restaurant where people were able to take photos or selfies to create memories of TIFF 2018. Located at 319 King Street, La Fenice is my favourite restaurant on the King Street strip. It is credited with serving the most authentic Italian food in Toronto. I first discovered it many years ago during Summerlicious and still enjoy dining there. The south and west facades of the Bell Lightbox, the view from the corner of Widmer and King Streets. View of the cafes opposite the south facade of the Bell Lightbox. The Princess of Wales Theatre decorated in blue for 2018 TIFF. Crowds awaiting the appearance of movie stars outside the Princess of Wales Theatre. A colourful display created by Lyft for the 2018 TIFF. Historic St. Andrews Church at King and Simcoe Streets. In the foreground is a Toronto information tent. In the background of this photo is the Union Building, constructed in 1908 as the head office of the Canadian General Electric Company, a manufacturer of various electrical products and appliances. On John Street, a short distance south of King, “No Frills” Grocery chain held a movie trivia quiz that attracted many people. A table tennis (ping pong) game on John Street, the Bell Lightbox in the background. Second Cup serves complimentary samples of coffee at the corner of John and King Streets. TIFF 2018 was great, and the outdoor activities on King Street were better than ever. 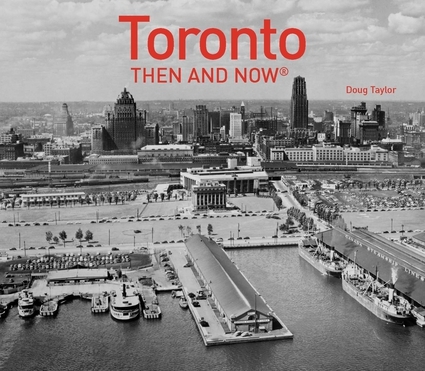 The recently published book about Toronto’s old movie theatres is now available in the TIFF book store. TIFF members receive a 15% discount on the $21.99 retail price. The publication explores 50 of Toronto’s old theatres and contains over 80 archival photographs of the facades, marquees and interiors of the theatres. It also relates anecdotes and stories from those who experienced these grand old movie houses. King Street on the afternoon of the day TIFF opened, Thursday, September 5, 2014. The crowds had not yet gathered. King Street gazing west at John Street, on the evening of September 6, 2014. The crowds had certainly arrived. The closing of King Street to vehicle traffic for four days during TIFF 2014, allowed Torontonians to discover the possibilities when streets are open to pedestrians only. When we consider how many people are living in the core of the city, the surrounding suburbs, and the number of tourists visiting from around the world, it is a pity that our streets are so rarely open for strolling and relaxation. Because we live at a latitude that possesses short summers, the tragedy of this situation is compounded. More and more people are now purchasing homes in areas throughout the metro area where they no longer require a car, in districts close to the subways or streetcar lines. Throughout the years, TIFF has constantly strived to showcase Toronto to the world. The closing of the street in front of the Bell Lightbox is a further extension of this concept. During TIFF, to stroll along King Street, especially at night, has always been a unique experience, but this year, it was doubly true. King Street looked great! It is a pity that the street was closed to vehicles for only four days. I faithfully attend TIFF each year. I usually do not attend the Hollywood premiers, but prefer to view foreign films and relatively unknown movies that I would otherwise not have an opportunity to see, including many Canadian films. I particularly enjoy the discussions with the actors, producers and directors that follow the screenings. I consider TIFF one of the most important events of my year. When the festival is not in operation, I continue to attend the Bell Lightbox to view some of the classics of yesteryears, particularly those that I remember from the days of my youth when I attended Toronto’s old historic movie venues. It is great to view them on the big screen as they were originally intended to be seen. The Bell Lightbox has become an integral part of my entertainment world. Cafes in front of the the Bell Lightbox on King Street West. The stage on the reflecting pool on the north side of the Roy Thomson Hall, where a sound system and DJ played music for the guests on the terrace of the hall. Picnic tables on King Street to the west of Simcoe Street, the 1908 Union Building in the background. Restaurant patios directly opposite the entrance to the Bell Lightbox. Giant chess board on King Street during TIFF 2014. The closing section of the book is about the Bell Lightbox, one of the best of the city’s modern theatre venues. The book is available at Chapters/Indigo and the book store in the Bell Lightbox. It will also be featured during “Word on the Street” on September 21st.